I don’t like most songs that are on the radio. Well, let me clarify. I don’t like the songs on the radio that are dance-centric, the songs that encourage people to dance. Huh. Dancing. Dancing is terrible. Moving your body around in tune with music. It’s so…. simple-minded. It’s so primitive. So what, in a song when they sing “Put your hands in the air”, you expect me to just do that? Please, I’m not a dog. I have some self respect. 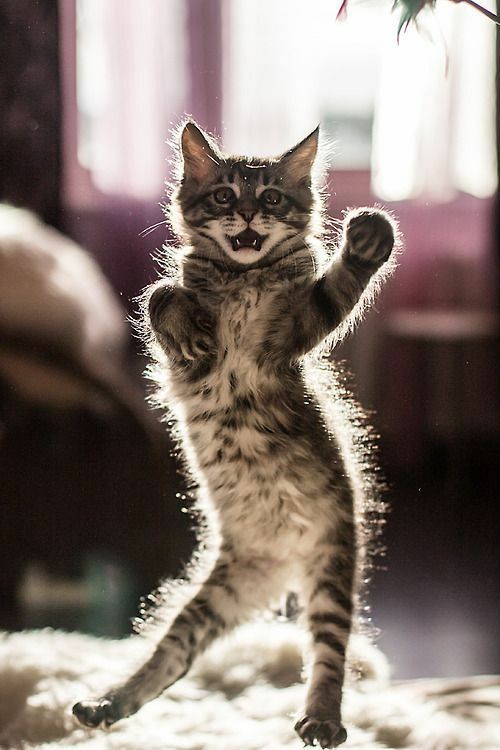 We cats have evolved past dancing. Do you know how ridiculous you look when you dance? Unfortunately, in my life I am often forced to dance. She Human will sometimes pick me up and swing around with me. She grabs one of my paws and moves around in circles with me. It’s terrible. And I try my best to make it very clear how much I dislike it. I look away, I try to jump down, I growl. She doesn’t seem to care. Does she think I enjoy dancing? As if I ever wanted to dance. The Humans put their music on really loudly and force me to listen to terrible songs that are supposedly popular. I don’t buy it. Most of the artists the Humans listen to is just terrible. Except Shakira. Now, let me just say that if we could all only move like Shakira, I might like this dancing business. She may be the only Human who looks good when she dances. And make no mistake about it, I could absolutely dance like Shakira if I wanted to. I could make my hips move as if independent of my body. But I don’t want to. I don’t want to embarrass the Other One with my superior dancing skills. It would only make him more jealous of me and all I can do that he can’t. I’m just that considerate. This may not come as a surprise to you, but I’m quite well read. More than the average cat, to say the least. In fact, I’ve even been trying to teach the Other One how to read, but he’s hopeless. It’s like all he wants to do during the day is sleep. I read the New York Times everyday, as well as the Wall Street Journal and the New York Post, because sometimes you just need your gossip. I’m not above it. I often read the books the Humans leave lying around here. After my mid-afternoon nap and my second breakfast, I like to meander over to the bedroom, where they keep their books, and I’ll get lost for a few hours; it’s just delightful. She Human really tends to gravitate towards the novels, which I thoroughly enjoy, but when I need a good nonfiction, I see what He Human is reading. I don’t understand how these two are together, they have completely different tastes when it comes to the books they read. Personally, I could never be with someone who didn’t read both fiction and nonfiction regularly, but that’s just me. I’m quite particular in my mating choices. The Humans started this a few weeks ago. It’s called the “Whole30”. Whole what? 30 what? The name makes absolutely no sense. All I know is that the Humans have been extremely cranky as of late and are cooking quite often in the kitchen. All they do is eat meat. What could possibly be so terrible about that? Plus, they give me the leftovers almost every night, and if there’s anything I love more than smelling meat all day long, it’s eating their leftover meat three times a day. She Human just keeps saying how she doesn’t like eating that much meat because she “used to be a vegetarian”, which is just a fancy way of saying you are a complete idiot– it’s a ridiculous concept if you ask me. She Human didn’t eat meat for a really long time. No meat. At all. Like she wouldn’t touch it. I tried to tell her, “If you don’t like it, you have a four legged Superior who will devour anything you leave for me”. She never seems to understand my reasoning. So on this incredible diet, they are also eating lots of vegetables and fruits. Now don’t get me wrong, I love meat, but I also love a good veggie every now and again. There’s nothing like a tasty piece of broccoli or spinach found on the floor, and don’t even think about leaving a head of cauliflower unattended with me around. But back to the meat– that is absolutely the best part of all this. I have been living like a king. She Human eats tuna everyday. I hear that can crack open, and I’m on it like…. well, a cat to tuna I suppose. That’s an expression, right? You heard it here first people. This Whole30 is just the best thing to happen to this household since I came around. Wait, what’s that I hear? Tuna?? Well it’s finally happening. The Humans are traveling again. They kept saying “Greece”, but who knows what that means. Greece. Sounds like a fake place if you ask me. Or the name of an excellent Olivia Newton-John movie. I absolutely love it when the Humans go away and I get the run of the roost, allllll to myself. Well, almost. The Other One often spoils it for me. I’ll be darting around a corner at just the right speed, turning at the perfect angle, positive I won’t be hitting a Human calf or something, and BAM! There he is. Then he laughs and walks away, with his tail in my face. I know he plans it. He always ruins my fun. But seriously, even with that turd here, it’s still amazing to have them gone. The havoc I could wreak on this place is amazing, and the fact that I don’t just shows my restraint. But the best part about them being gone is what I do that they’ll never know about. Like lick the kitchen counters. Drink out of the toilet. Lock The Other One in a room and invite the cool cats over for a little get-together. He hates it when I do that. But maybe my best trick is when I use the sofa as my personal scratching post. I scratch, then return it to its former condition using She Human’s needlepoint apparatuses. I mean, She just leaves them around, it’s almost like she’s challenging me not to use them. I scratch up the couch good and nice, then I take her needle and meticulously pull the strings back to where they were. It’s ingenious if I do say so myself. It’s true though, when they leave there are things that can’t happen, like get my back scratched or sit on their chests and try to distract them while they’re watching “the game”. And when they do get back, they give me all sorts of treats, like they’re trying to make up for being gone. As if I cared. Good riddance. Well summer is here. This is truly my least favorite time of the year. The days are long and hot, I have to lie around the house all day and sleep, too many sunshine spots to avoid…. it’s so different from the other times of the year. The Other One keeps saying my life is exactly the same in the summertime, but he’s an idiot. Summertime is truly terrible. The thing I’ve realized I despise most about summer is the fact that the Humans always have people over. These strangers come knocking on the door, they all hug and say hello, then they go outside to eat or play games. Why?? What is so wrong with just the people who live here hanging out? Why do we need to include other people? What is so terrible about just having us here? Here’s my beef with guests over: they smell very strange. Anything or anyone new always smells strange. Like when the Humans go buy groceries, and then they bring it into the kitchen and it stinks. Or She Human will go buy new shoes, and she’ll put them on and they stink. The Other One and I talk about it all the time. I mean, I know we Felines are superior to Humans in every way (particularly when it comes to our sense of smell), but do the Humans really not get how stinky other people and new things are? I’d like them to trade noses with us just for a day and see if they ever invite people over. The worst are the dog people. I can smell their Canine on them the minute they walk through the door– it’s atrocious. One time, the Humans invited one of these people over– and they brought their dog into the house. The nerve! As if I couldn’t smell that beast from a mile away! I bolted to the basement and stayed there for the rest of the day, just to make my point clear that those creatures are not accepted in my house. But I digress. As long as the Humans don’t invite anyone over this summer, I expect it could be mildly pleasant. If not, I’ll just find an especially secretive spot to sleep in when they bring the uninvited-s over. That is how I hear She Human refer to Beyoncé. Queen Bey. The Queen. Queen B. Or lately just an emoji with the lemon symbol, which is one I have yet to figure out. She Human is quite excited today because Queen Bey announced she is pregnant with twins. She’s practically running the internet right now, something I can most certainly identify with. And I must say, I’m excited as well. I mean, who best represents the peak and pinnacle of a career better than Beyoncé? I can absolutely empathize with that– I myself am at my peak. Of everything. I know how to get in formation too. I make all the other cats of the neighborhood practice the dance moves at my house when the Humans are gone. We get in formation, we have hot sauce in our bags, and we slay. We both mesmerize people with our Super Bowl performances. Last year, the Humans invited some people over, and I had the audience absolutely captivated with my rendition of chasing the pink mouse toy. I was showing everyone my best moves. I did back flips and hissed loudly at my toy. The Humans were in absolute awe. I also drop artistic masterpieces without any hype or promotion, much like Queen Bey has done with her last two albums. Did you see my video earlier today? It almost broke the internet. And I did it without any fanfare or interviews. That’s just how we roll. We are both extremely private about our personal lives. I don’t need people investigating every aspect of my nine lives. I have some self respect after all. Do people really need to know what I eat for my meals three times a day? (Hint: they’re all the same.) And do I really need to share my exercise regime with others? Why would I share my secrets with others? This physique is mine, and I won’t let anyone else know how to get it. Simply put, we’re both flawless. So there you have it. I’d say at this point one of the only differences between us is that she beats me on Instagram by 34,734,534,445 followers. I’m working on that and am confident I’ll get there. I slay, trick, or I’ll get eliminated. It’s January, that time of year when the Humans make resolutions and try to stick to them for the year. Sometimes it’s something easy like flossing everyday, other times it’s something more abstract like “being a better person”. Last year, She Human wanted to say something nice about a co-worker everyday and He Human was going to drink a glass of green tea a day. She was smack talking within a week, and He had to throw all the green tea out that they bought because it went bad. Idiots. Don’t they see the same pattern year after year? These resolutions only last a few weeks, just stop it. Make no mistake, I don’t floss or drink green tea, nor do I want to in the slightest. I make no resolutions. I have nothing to improve on in my personal life. As I have stated in the past, I am in peak physical condition, I sleep like a baby, and my play session skills are only improving everyday. However, I decided this year I will break tradition and make a resolution for the first time in my life. I resolve to hold the Humans to their resolutions. These clowns could use a little help. This year, She Human’s resolution is to keep her closet clean for the entire year– put clothes and shoes away, fold everything, etc. Ha, we’ll see how much her resolution holds up. I’m going to make sure she cleans it everyday. There’s nothing I love more than a nap on a nice cashmere sweater, or pulling the jeans off the shelves and watching them fall. She Human will have plenty of work to do because she’ll be cleaning her closet everyday. It will really make her feel better about herself. He Human’s resolution is to pick up a new hobby. He randomly pointed to a list of boring activities and selected bird-watching. And he didn’t change it. First of all, what a nerd. Second of all, I totally support this activity. It’s almost like he picked it for me. My specialty these days is squirrel-watching, but I’m happy to make the transition to birds. Equally delici– ahem, beautiful creatures. Maybe he’ll even take me on one of his outdoor bird-watching adventures that he’s been talking about. And by take me, I mean I’ll sneak into the back of the car and leap out once we’ve arrived. He’ll have no choice. I might even have a snack or two while we’re out there. Wild bird is quite a meal. It really is the perfect plan. So you see, I really am a very considerate pet. What better way to show the Humans that I care than by helping them with their resolutions? I truly do want them to succeed in their (useless) endeavors. The Other One keeps telling me I’m doing it more for me than for them. He’s a fool. Today, I will be voting. I will go with the Humans to the polls and I will vote. (Lacking opposable thumbs will make this a bit more challenging, but I am resourceful.) I will not vote for the Democratic party. I will not vote for the Republican party. I will not vote for any third party. I will write in my candidate for President. I will write in my own name. I will write in Señor Gato. I encourage you to do the same. Let’s be clear here, I would make a phenomenal President, for many obvious reasons. Allow me to lay out my platform for you Humans. Making decisions for 300 million people requires a lot of brain power, which can only be achieved by copious amounts of rest. I commit to being the most rested candidate in the White House’s long (and far too productive) history. Daily napping in the Oval Office will be required, for me and all my Cabinet. I will require that the members of both the Senate and the House take mandatory naps every day as well. I will require that play sessions occur every 45 minutes. Studies show that the brain works better with frequent play sessions because the physical stimulation causes more synapses in the brain and energizes it. Plus, play sessions totally rule. I myself have a pink mouse that I chase with fervor regularly. I will also mandate that serious discussions only occur between the hours of midnight and 3 am, as that is when I am at my most productive. Being a nocturnal creature, I find that I really only want to do real work during those times. In addition, all decisions will be made by me and me only. My Cabinet will state the facts of whatever issue is at hand, and I will give them a simple answer of either “yes” or “no”. No follow up questions are allowed. Ever. They just take too long and interfere with play time. In my first 100 days in office, I will increase the minimum wage to 30 treats per hour, I will remove the reflecting pool from the Lincoln Memorial (I hate water), and I will cover the Washington Monument with carpet to use it as a scratching post. I’d have the sharpest claws in all the land. Basically, you too should write in Señor Gato in your ballot when you cast your vote today. There is no party like a feline party. We truly are the best of all the creatures on this planet. Make a good choice. Vote Señor Gato for President. Well, it’s Friday. The Humans always seem to get so excited about Friday; I’m not sure why. They’re gone all day during the week, probably off at some fair or something else really fun that they don’t bring us to. They come home exhausted Monday through Friday, moaning about their day and saying how “hard” it was. Yeah, like playing hookey all day is tough. Please, I’ll show you what a tough day looks like. How about when you come home and wake me up from my second mid-afternoon nap? Don’t you lecture me about tough. Then Friday arrives, and they come home and sit on the couch and eat and drink. For the next 2 days. I know that Monday through Friday they’re Out There, having the time of their lives, being all selfish and not sharing any of it with us. It couldn’t possibly be more fun at home than it is Out There. Why do they get so excited for Friday? Sometimes though they do leave at night. They’ll leave the house totally normal, then when they return hours later it’s like a hurricane. They aren’t making sense, they want macaroni and cheese, and they keep falling and dropping things. Their voices also sound different. It’s like they have marbles in their mouth or something– they’re very hard to understand. Whatever they do on these nights doesn’t seem fun at all, they just look like idiots. After the making of the food and the repeated “I love you-s” (both to us and each other), they pass out. Like way out. Like tapping them on the head and meowing very loudly doesn’t do anything. One time, I even bit He Human’s nose. Nothing. He didn’t even notice the mark the next morning. On these days, when they do finally wake up the next morning, it’s very strange. They just sit on the couch all day and watch TV. And moan. They watched Lost for 4 hours one time. But seriously, whatever they do during the week couldn’t possibly be “hard”. I seriously doubt the Humans are doing anything that is remotely “hard”. To understand what this word really means, they’ll need to talk to me. My life can be very difficult. You remember the nap interruption from earlier, right?